If you need convincing that Super Bowl Sunday has evolved into a national holiday, consider this: It’s now possible to hear arguments about the proper way to observe the occasion. Why, it’s practically Christmas in February. 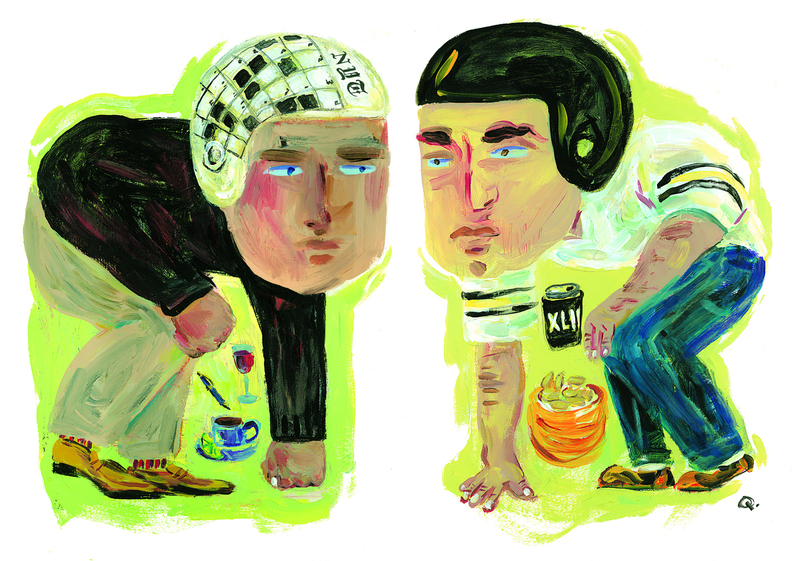 Attend a party and inhale hors d’oeuvres, or stiff-arm the whole shebang and go skiing? Hot wings or contempt? OK, no high-profile bloviator has furrowed his brow and declared that there is a cultural “War on Super Sunday.” Not yet, anyway. And there aren’t greeting cards. But if you assume everyone is on the same page about the National Football League’s big finale, prepare to be thrown for a loss. When it comes to attitudes about today’s televised extravaganza, there is a yawning divide. Shocking as it might be to some snack-food shoppers, not everyone will be part of the huge viewing audience. Sure, commentators have bemoaned the hype and excess for decades, all the while treating the game itself as if it were something that truly matters. But these days it’s possible to find people who don’t just have qualms about the hoopla. These critics pointedly reject the very notion that the big game and its glitzy trappings merit attention. “I never watch the game because there’s always something better to do,” said Ellen Sherriffs, a teacher who lives on the South Hill. So, no sack dances in the living room for her. In the eyes of some, the Super Bowl symbolizes a social mindlessness and triumph of corporate brainwashing not easily dismissed as entertainment. “I’d say it was a harmless opiate to occupy minds and divert attention away from real life, but it’s not harmless,” said a Spokane technical writer who did not wish to be quoted by name because he is tired of being branded an elitist. Others view the occasion as a happy excuse for social gatherings. Did she mention food? Her brother always makes two vats of chili, one mild and one scorching. “One year he had waivers for everyone to sign who tried his hot batch,” Paredes said. To Karen Buck, a local nurse, it really does feel like a holiday. Of course, not all attitudes about the Super Bowl are polarized. Countless onlookers express their qualified enthusiasm for the spectacle by declaring that they watch only to see the commercials. Others say they’re mostly interested in the halftime entertainment. Then consider Genevieve Mann Morris. The Spokane lawyer has attended her share of Super Bowl parties. But this year she’ll be taking part in the fourth annual Women’s “Souper” Bowl skiing/snowshoeing benefit for the Women’s and Children’s Free Restaurant, an event she helped organize. She said she likes the idea of being involved in a women-focused activity – especially one that connects with her personal values – on a day when much of the country pays homage to a males-only sport. Spokane pharmacy technician Carol Voogd has been married to the same football fan for almost XXXVIII years. She likes the idea of Super Bowl parties, at least ones that aren’t soaked in alcohol. “Friendships and camaraderie are built, which are really important in our culture of going home from work and crashing,” Voogd said. She is troubled, though, by issues such as public financing of sports stadiums, the off-field conduct of some professional athletes and her suspicion that the NFL exists largely to sell beer and cars. For some, the fact that so many people will be home dripping cheese dip on their chins is an opportunity. Bob Brown, a retired lawyer in Coeur d’Alene, savors the fact that movie theaters aren’t apt to be crowded today. Though it’s not unusual to hear “Ya gotta love it” about the big game, the truth is you don’t gotta. After all, no one forces you to watch the game or the hours and hours of programming leading up to the kickoff. Still, Super Bowl Sunday remains an extraordinarily popular square on the calendar. Millions celebrate. Churches amend their activities schedules. Lindsay Kalin, who works at a sporting goods store and lives on the South Hill, doesn’t hesitate to declare herself a fan of the occasion. Jon Snyder, publisher of Out There Monthly, is hardly a couch potato. Still, he suggested that there is something special about this TV-focused day. Nan Livingston said the annual party in her Moran Prairie neighborhood is a big deal. Ponderosa resident Shirley Pantaleo and her husband moved to Spokane from Pittsburgh. They always host a party. They even enjoy having guests who root for the wrong team. Of course, many viewers don’t declare an allegiance beyond their 50-cent bets on the number of points that will be scored in the first quarter. Maybe information technology manager Hank Greer is typical. “I always enjoy seeing a good play made and it doesn’t matter to me who made it or which side they’re on,” he said. So does Super Bowl Sunday deserve to be regarded as a holiday? Maybe it does, said Craig Numata, a Spokane accountant. Why? Because, when it’s over, he experiences a post-holiday letdown. Paul Turner can be contacted at (509) 459-5470 or at pault@spokesman.com.